More recently she’s been working on adding the ability to expand the sidebar sections to the full screen so you can browse More applications or files. Colin, taking a break from saving the world for D-BUS, added a user menu to the right side of the panel, based on Jon McCann’s applet from GDM. Now you can actually log out, switch users, etc, from within gnome-shell. Colin also did a quick hack to get the current GNOME taskbar to show up at the bottom of the screen so that you can see minimized applications and appications flashing for urgent attention. We’d like to do something better, or at least visually slicker, in the long term, but this fills in a big hole in the abiity to just use GNOME shell day-to-day. The largest number of contributions so far have been to a unsurprising place – to the build setup script: William Lachance, Mads Villadsen, Siegfried Gevatter, and Timbobsteve have all contributed to it. It now figures out what packages you need to install for your distribution ahead of time, instead of breaking obscurely halfway through, making it easier than ever to try GNOME Shell out. Thanks also to Achim Frase for testing and bug reporting. There’s some more interesting work in the pipeline – enhancements to the “More” views, monitoring the applications that the user is using and so forth. See our Todo for ideas about ways you could help, or join us on IRC in #gnome-shell and ask questions. This entry was written by Owen and posted on February 10, 2009 at 1:31 pm and filed under Coding. Bookmark the permalink. Follow any comments here with the RSS feed for this post. Both comments and trackbacks are currently closed. These screenshots look great, I am very excited to see where this ends up. Does the + button call a medic? I would really love if you guys find a way to introduce a gnome-do like functionality to that. I always get worried when I see things like “most often used applications”. Good GUI for me personally is predictable UI – if I can type or click the next few actions with eyes closed (or nearly), then I can work really fast. However, if the menus and launchers change on use, I have to slow down. Nice. It would be great to include somekind of gnome-do/deskbar-applet functionality in the shell, to make it more task oriented. Thoughts? Is there any particular reason that gnome-do like functionality should be implemented here, rather than simply running gnome-do? Feel free to make it easy to interact with the most-used-applications data and hook into the rest of the shell, but should the shell really do _everything_? What about recently used application? Are those the ones that appear in the activities? A global menubar (the gtk window menubars moved to the top pangel) should be part of this project! Future-proof now! @ulrik: that would indeed be interesting. I second the idea of a GNOME Do-like keyboard interface. But maybe the best way to do it is to expose the functionality via accessibility toolkits, and let people build a GNOME Do-like interface on top of that. 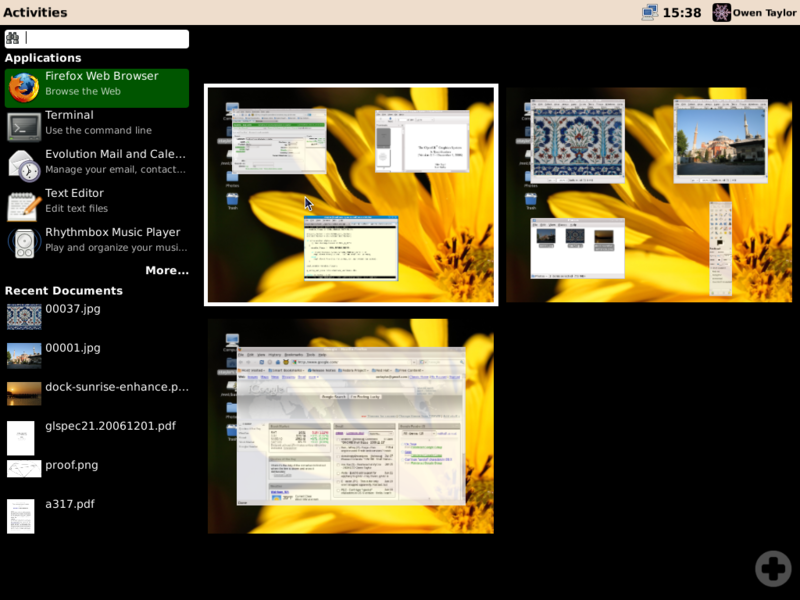 That idea has been brought up on the Planet a couple of times, and it would be great to see that take root in the GNOME shell, especially since this shell work is really looking very nice and innovative. Exciting stuff. I really like the general direction this is going in. If you’re looking for ideas for how to redesign the task list, I put a design idea on the GNOME.live scatchpad  which might be of interest. How do you select the applications that will be displayed in the quick launchers? I’m still waiting to see the results of any usability tests that show that any of this stuff is actually any better than what we already have. I thought the whole point of this round of redesign was to gather user requirements first, and do iterative design from those? Otherwise, we’re just going to end up right back where we started, i.e. a desktop designed by hackers, with the usability folks reduced to tidying up the buttons afterwards. Out of curiosity, is there going to be any effort in cooperating with KDE and E17 on the new systray spec? It would be a shame if GTK+ applications failed to display themselves properly in modern desktop environments. @Sam: I’m not sure what you are talking about in particular, people from all environments are pretty good about discussing changes on xdg@lists.freedesktop.org. This looks like one of those things that I would play with for 5 minutes and then switch it off and forget about it. Here is the main problem I see: From the videos, it seems that the Gnome Shell thinks what is most important is the Gnome Shell. The desktop and applications get thumbnailed, and the user is expected to do gymnastics like drag & drop simply to start an application. That’s fun the first three times you do it, but then it’s just awkward. Drag and drop is not even an easy, simple motion. I’d rather like to see a shell that is integrated into the desktop rather than a desktop that is integrated into a shell. Marcus: you can also click on launchers to launch them. DND to launch is, in fact, a very convenient and natural way to start multiple apps on different desktops (try building the shell and try it out! ), but like most uses of DND it’s not very discoverable. I’m closing this post for comments now; feedback appreciated on our mailing list, or hop onto #gnome-shell on IRC and talk to us in person.